When I first heard the rumor that Wizards were going to add a collectable card game element to Dungeons and Dragons in the form of “Fortune Cards”, I took it as just that, a rumor, not unlike Elvis and Sasquatch sightings. As evidence began to mount that pointed towards this becoming a reality I of course reacted as any well adjusted man-child would, with massive denial. The walls, as they say, came crashing down when I saw this advertisement. All I can say is why Wizards? Why? Why do you want to hurt me like this? Haven’t I always been loyal? I won’t even go into the mechanical ridiculousness of these things. Do we really think that characters are so underpowered or in need of some help in 4th edition? Anyone who has DM’d in these char-op/min-max days could probably attest to the opposite being the case. 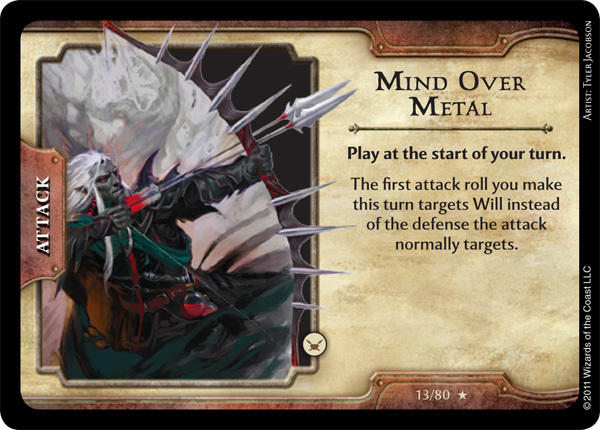 So much so, that even Wizards updated the damage progressions on their monsters and totally revamped solos. Given this, it makes perfect sense to give characters extra benefits each round. Honestly, someone needs to take Wizards out back and smack some sense into them. I want this cash grab to fail sooo badly. I want it to be an epic fail of such proportion that it requires a scapegoat. I want it to be such a fail that it makes “New Coke”, “Betamax”, and “HD dvd” look like massive successes. I have no idea what course Wizards has plotted in, but I am growing increasingly concerned and have officially strapped on my parachute. I desperately hope that I am being overly histrionic. The path was clear and the stage was set. All that remained was for the curtain to raise and the show to begin. The party left Tanaka Khan and the rest of the serpent clan, who agreed to watch over the gang’s new digs, and headed out to lay a beat down on one Blightongue. 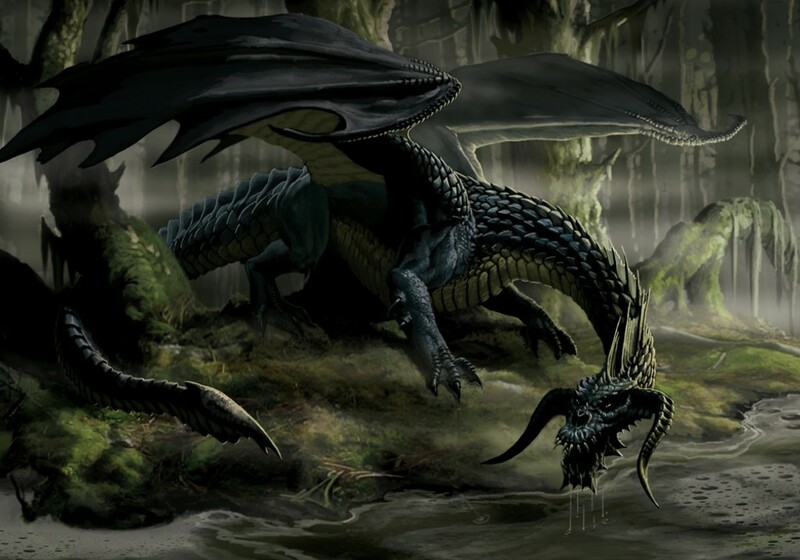 As they approached the lair, Garrick scouted ahead, looking for a hidden way to gain surprise. He was able to find several entrances in the side of the cave that appeared to have been purposely sealed, which left either the cave mouth or a 100 foot drop from the large opening at the top of the mountain structure. The party remembering the final confrontation with Kalarel and the “flaming corpse” incident decided for the non-aerial assault. As they approached the inner sanctum of the lair they were met with a damp darkness and the sound of lapping water from the underground pond. Minutes passed and…nothing. As they tentatively began to explore the lair a hissing voice began to speak to them seeming to bounce from shadow to shadow. The voice asked if they had come to pay him tribute. Khaine attempted to bluff the dragon into a false sense of security, but Blightongue was no fool. He offered them a deal; leave their magical items, coin, and one member of the party (preferably not the Goliath as they tend to taste a little gamey) and the rest could walk out alive. After contemplating this for a little too long they decided to give Bligthtongue the middle finger, at which point he exploded out of the pond and fell upon the party, who were in perfect breath weapon formation, with a savage beauty. The battle raged back and forth, with Rhogar striking the final blow with his massive fullblade biting deep into the dragon’s neck. The party quickly collected the blood for the ritual and looted the lair, and was off to cleanse their taints. They arrived back at their new mountain stronghold to find Tulach, the seemingly senile old prospector from New Dale, had hired himself on as their butler/manservant and to find Elminster lounging at a table sipping some wine. As they begun the ritual to remove the divine brand, they were assaulted by horrific creatures from the Shadowfell that poured forth from the rift that was opened as part of the ritual. This seemed like a coordinated attack and a possible assassination attempt on Elminster during his vulnerable state. The party was able to keep the ever increasing hordes of creatures’ crossing over from Elminster, as Kaz bent his will to aiding in the completion of ritual. After all was said and done, Rhogar noticed that Elminster didn’t use any of the Black Dragon blood in the ritual. Elminster apologized and said he was mistaken and that it wasn’t really needed. When Rhogar asked him if he wanted the blood anyway for future magic making, he said no thanks as he has a ton of it already. The Red DM has started a blogathon to help those suffering from Editionitis, a crippling affliction eliciting a burning or flaming sensation in ones dice bag that results in bitter, bile infested, and derogatory rhetoric being ejaculated out over the interwebs at individuals with very similar but slightly different hobby interests or tastes. He is encouraging us to join him in focusing on the awesome aspects of each edition of Dungeons and Dragons in order to counter act all the bad juju out there. I started out with the Moldvay Box Set way back when I was a fresh face 11 year-old, whose imagination was just beginning to be stirred awake by Greek mythology and Arthurian legend. What I loved about that box set was that it was completely different than anything I had ever seen before and how it brought to life many of the creatures and heroes I had begun to read about. It seemed so much more adult and important than the games I had previously played. I loved the dice, the feel of them in your hands and how you could spin them; they just looked so freaking cool. I loved rolling up and creating characters, generating ability scores, picking out equipment and spells; and then filling out the character sheets, which just looked way cool, like some very important document. Then there was the magic… I remember pouring over each spell and what it could do, picturing its effects in my head. I also loved the modules and the incredible stories they told. My box set came with Keep on the Borderlands, and I still to this day remember the elation at Moonglum, my 1st level Elf dropping a Kobald with his longbow in my first ever battle, played out on the asphalt during recess with Jamie Thompson. 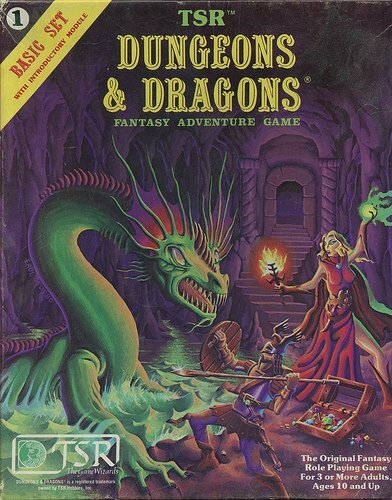 Waxing nostalgic about Basic D&D also evokes a sense of regret as I don’t think I ever experienced a true campaign or what the game was capable of offering. My friends and I were Munchkins to the bone, but not in a purposeful way. We were just really young and although our minds had begun to open to creative possibilities it would be a couple years and different game systems before they would truly blossom. In the end, what was most awesome for me about Basic D&D was that it was like I found something I was desperately searching for without actually being aware that I was in need or searching. In his recent article “Make D&D Better, Remove Fighters From the Game” Buxtehude took a massive dump on the 4th edition defender, and in particular Fighters, and to some extent those who make and play them. The gist of his diatribe was that the gimmicked-up/twinked-out fighters, which he calls “Conscore McSwordy”, can wreck the fun of the game by grinding down the fluidity of combat movement and fast passed action through their marking mechanics, rock like defenses and durability, low damage output, and tendency to be poorly role-played if even role-played at all. The response to this article has been slightly amusing, and poor Buxtehude has taken some heat from commenters essentially calling him an idiot, a bad DM, and then flaming the website for putting up such rubbish. I can assure you he is neither and idiot nor a bad DM nor was the article rubbish, although this does sort of shed some light on why the lovable Drax (my Dragonborn Paladin) from the first season of D&D encounters usually ended up unconscious and making death saves by the end of the first round. While I of course disagree with his opinion, I do agree with a lot of the points he does make, as I have been his “Conscore McSwordy” in games as well as had my DM nads skewered by a “McSwordy”. All I can say is “don’t hate the playa, hate the game” son. One can make these kinds of arguments with almost any well built character of a certain role. D&D is a system that somewhat encourages and rewards well built characters these days, and these issues are a natural consequence of moving to a system where character classes and their abilities have been crafted to function in clearly defined roles. For example nothing neuters the threat of an encounter the way a well built or optimized healing cleric can. Alternatively, I have played in games where as “Conscore McSwordy” I couldn’t even make it to an enemy to lock it down before it was killed by a supremely twinked up ranger. As for his lack of role-playing gripes, I feel this is really player and game dependant rather than something to be heaped upon the fighter and those who love and play them. In the end, D&D has always been a game that supports a wide range of play styles (even in these more tactical wargamey times), and problems can arise when styles clash, which underlies the importance in gaming with like-minded people who have a similar vision and play style, or at least close enough on the continuum to not drive someone nuts. If you haven’t already you should check out Buxtehude’s campaign and other musings at his base of operation in The Shattered Sea, where you will find that he knows his stuff and is a good DM. In the future if you sit down at the table to run a game and you look up and lock eyes with one of us “McSwordy’s”, remember artillery targeting reflex/will and monsters with auras if you want to try and teach us a little humility….”try” being the optimal word.